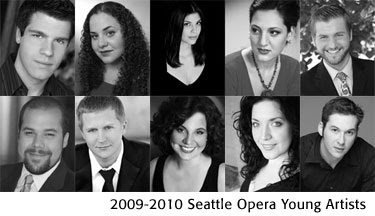 Seattle Opera has named the ten artists who will be participating in the 2009/10 Young Artists Program. The singers, selected from over 640 applicants, are: Erik Anstine, Jenni Bank, Megan Hart, Michael Krzankowski, Maya Lahyani, Alex Mansoori, Eric Neuville, Vira Slywotzky, Marcy Stonikas, and Bray Wilkins. Biographies of the singers are available here. This fall, the Young Artists will present an abridged version of Mozart’s Così fan tutte at the Illsley Ball Nordstrom Recital Hall at Benaroya Hall on November 20. Additional venues will be announced at a later date. During the winter they will participate in German art song recitals—a new addition to this year’s program—and work with students in the Opera Goes to School program to present Siegfried and the Ring of Fire at local elementary schools. In the spring, they will present a fully staged production of Richard Strauss’s Ariadne auf Naxos at Bellevue’s Meydenbauer Center. Tickets for the spring and fall productions will be available through an online pre-sale starting September 12, and through phone and in-person sales beginning September 14. Learn more about the Young Artists Program.